When you like the outdoors, but don’t really want to lose connection with your friends and social media, it’s quite important to get all the tools you need to do both at the same time. You can definitely put your trust and faith in a portable solar charger, but only if you keep in mind few things before shopping. For instance, the larger the solar panel, the more sunlight it gets and the faster is able to turn it into power stored in a battery. Even though a smaller panel is so much easier to pack (and you should keep this in mind next time you’re hiking), the longer it takes to charge a battery. Another good thing when having a larger surface area on your solar charger is that it works better on a cloudy weather, on an low-angled position or low-intensity light (wintertime is a good example). 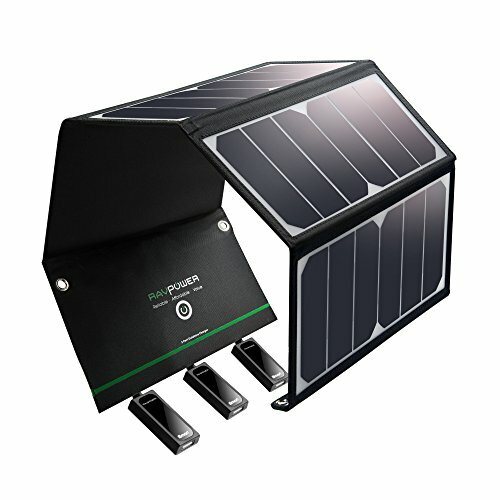 Take a peek at the watts on your portable solar panel. The higher the number, the more electricity you get so choose according to your needs. If you’re really into gadgets, you may want to sacrifice weight and load of your backpack and get a larger portable solar charger that can give enough power for all your devices. Another feature you’d like on your portable solar charger is its flexibility. As you bend, jump and ride your bicycle, last thing you’d want is for your solar charger to be stiff and rigid, unable to take all your movements. Therefore, it’s better to get a portable solar charger that is flexible, easy to fold and to carry around. You don’t want to sacrifice its surface over its flexibility though. Look for the attachment options also as you do need to be able to attach it safely to your backpack, bike or tent. Don’t forget about the output connectors on your solar charger. If it comes with a battery (built-in or not), the connectors between panel and battery are included, so less worry. It may be that the solar panel comes with a battery individually, so you may have to check the output connector if it matches. What you do up there on your trails is also important, as it’s one thing if you’re riding the byc’ all day long (in which case you may get a solar charger for backpacking) and another one when you’re hiking through a deep forest canopy (not having much sunlight throughout the day). Long story short? Take a good look at what you outdoors so that your portable solar charger really keeps you connected through day and night. 1). If the weight and load of your backpack are essential to you, having a small and lightweight portable solar charger is the thing to go. 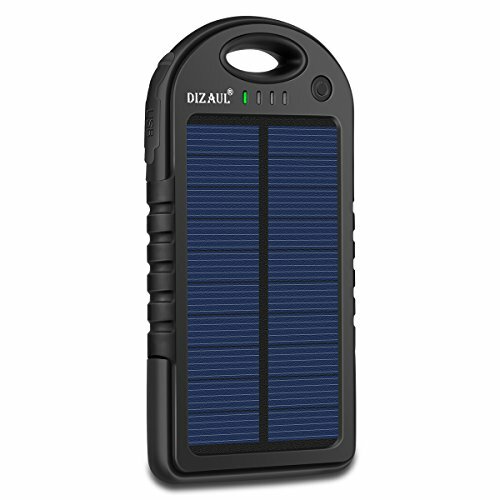 It’s the case of the Solar Charger Dizaul 5000mAh Portable Solar Power Bank that is more than a small size and lightweight, as it’s also reliable for some charging when hiking. Made with eco-friendly silicone rubber and ABS+PC material, the solar charger is easy to pack and to carry around. It has a good build and it presents a football grain design, combined with anti-skid protecting effect. It’s also water resistant so it can handle a few splashes. It’s also shockproof so it handles a few drops. As you want your portable solar charger to be easy to carry around, it’s essential to mention its free hook that lets you attach the solar charger for high portability. The USB ports are versatile and present protective rubber caps, increasing the water resistance. You may use the solar charger to power up your tablet, smartphone or other 5V USB-chargeable device. Even though it’s not that important, the portable solar charger comes in nice, pretty colors so you can play a bit when choosing. Nevertheless, the solar portable charge is small, lightweight, easy to carry around and…have we mentioned its low price? 2). If you’re looking for a solar charger, that powers up your gadgets and a bit more, don’t hesitate to give it a go with the Solar Charger, Solar Power Bank 10000mAh. 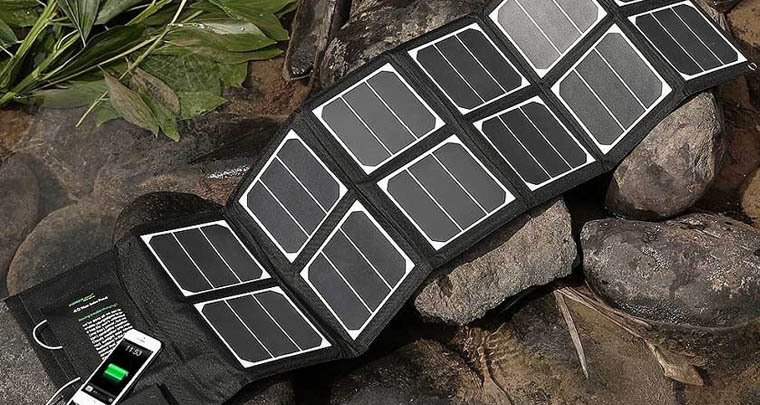 The solar charger has a heavy-duty build, especially thought out for the outdoors, which means you can definitely rely on in when hiking, camping or backpacking. It comes equipped with compass and 2Led flashlight, which makes it a great choice for the outdoors. The solar charger is not only water-resistant, handling a light rain, but also shock-resistant, taking a drop or two. It’s made with long lasting and tough ABS+PC+Silicone material. As for the flashlight, we can definitely say it’s quite bright and versatile, as it presents several lighting modes. The design of the tool is quite smart as it includes five pilot indicators that inform you on the level of the battery charger. Green light is on if you’re using the solar, whereas a blue light tells you the USB is charging. The versatility of the solar charger is great as you may recharge the solar panel by solar or outlet. The portability is great and you may easily hang it on your backpack for easier moving. You may use the external battery pack for your iPhone, smartphone, tablets, GPS, and so many other gadgets. Keep in mind to lay down flat the compass for more precision. Lightweight, water resistant, dust and shockproof and the tool comes with so many great features to use outdoors. For the versatility, portability and reliability, this is a great option for you to try whenever hiking, though. 3). 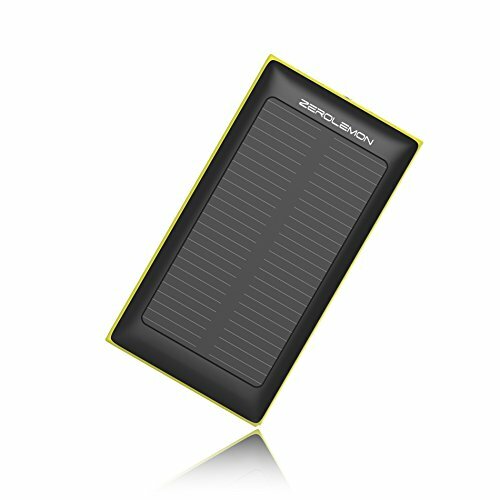 Designed to handle the water, dust and some shocks also, the Solar Charger External Battery, ZeroLemon SolarJuice 10000mAh is quite a dependable choice for any avid hiker. The solar charger is rain-resistant, shockproof and portable which counts the most when hiking or backpacking. It may charge your iPhone 50% for emergencies, needing a normal sunlight for charging. It’s not only compact, but also anti-explosion, ensuring safe use every time. It comes with a built-in battery so you can definitely taking it when hiking. The built-in 1000mAh Li polymer battery is good and the charger has dual output. This means you may charge more than one device at the same time. 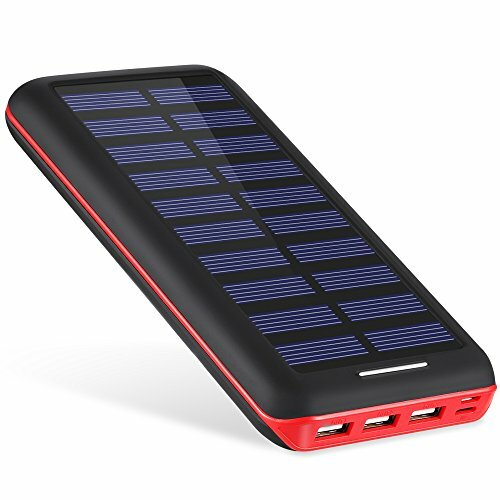 The features of the solar charger also include a LED flashlight that is great for the emergencies. The flashlight is easy to use and the 4LED indicators inform you on the level of charging/discharging process. The solar charger is not only well made, but it also looks cool. The yellow edges helps you notice it faster when on the move, whereas the rubber bumper protects when dropping it. It takes a charge very long and it’s great to have when hiking/camping. Despite the minor downsides, for all the good things it presents, we still consider the solar charger to be a nice tool to have on you when backpacking. 4). If portable means to you “easy to take along when running some errands downtown”, you can definitely put your trust and faith in the Battery Pack AKEEM Portable Charger 22000mAh External Battery Power Bank with Dual Input Port and Solar Charger. The charger comes with a compact solar panel that is more useful in the emergencies, when you can’t use the typical charging. The solar charger is versatile and its 3 USB ports allow you to use it for your iPad, iPhone and Android at the same time, at high speed. You may also use the charger for your iPhone or smartphone. The build of the solar charge is well made and the tool comes with safety features. It includes a dependable A+ Li-polymer battery cell that offers more than 800 battery charge life cycles. The solar charge doesn’t need much time to charge and holds its charge for quite some time. It’s easy to use and has quite a strong, sturdy build. It features lights that inform you on the charging process. Compact, well made and safe to throw in your backpack, the solar charger is easy to carry around. If you care more about reliability and efficiency, the charger is a good option when traveling, with a solar panel as Plan B. 5). The compact size of the Solar Charger RAVPower 16W Solar Panel with Dual USB Port sure recommends it as a great option for travelling, but the charger brings a lot more to the table. The charger includes Sunpower solar cells that are highly efficient, turning up to 23.5% of solar power into free energy. You may charge up two USB gadgets at the same time, which is always nice. The solar charger is not only compact, but also easy to fold so you don’t have to worry about finding its place in your backpack. The iSmart feature of the charger means the charger actually recognizes and adjusts itself to your connected devices, offering the best charging current, lowering the charging time. The Smart IC frequency technology identifies in fact your device’s input, distributing current output in the right way. The build of the solar charger ensures long lasting use as it comes in a waterproof sewn rugged polyester canvas. This means the device is water-resistant, taking the weather’s challenges. The design is well thought out and the solar charger features 4 hooks that securely hold it in place, for faster and safer charging. Small, yet powerful, the device combines iSmart and Smart IC technologies for better performance. The rugged build makes it a great option when hiking, cycling or spending some time outdoors. Nevertheless, for the good build, reliability and power, the solar charger is great to have when hiking. 6). 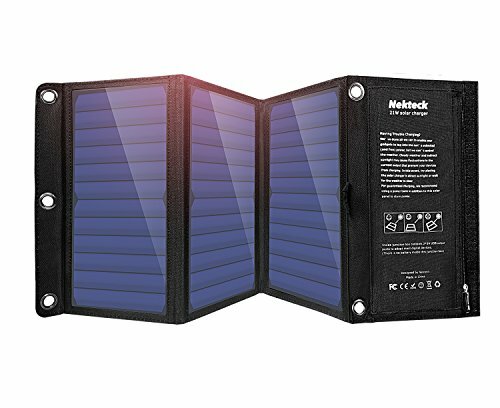 Powerful and fast charging, the Nekteck 20W Solar Charger with 2-Port USB Charger Build makes it to the top 10 for all the good things that surpass the inherent flaws. 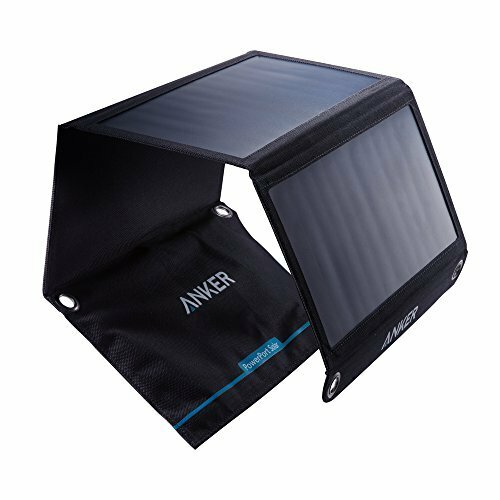 The solar charger is made of the 20watts Sunpower panel that presents a good 24% power conversion rate. You may use the charger to charge two devices at the same time. The build-in smart IC chip ensures fast charging and each port identifies your gadget, offering the best charging speed and power. The solar charger is compact and easy to fold for better storage. It’s build for the outdoor use and takes the light rain or the weather challenges. You may use the charger for your Apple or Android devices thanks to its standard ports. You may also safely carry it around as it loops very sturdy. The charger is well made and doesn’t need all the sunlight for charging. For the power and speed, not to mention the good build and easy carry, the solar charger is always a good buy. 7). The slim profile and power of the Anker 21W Dual USB Solar Charger, PowerPort Solar may be its strengths, but the solar charger gives you plenty of other various reasons for buying it. The Fast Charging Technology used on the charger explains its fast speed when charging, up to 2.4amps per port to be more precise. Therefore, you can totally charge two devices at the same time with the charger. The solar panels aren’t just large, but they also have a PET polymer face and are sewn into a durable polyester canvas. The solar panels are weather-resistant and tough enough to handle the backpacking. The stainless-steel holes on each corner ensure portability, keeping the solar panels in the sunlight, but in a safe way. The list of good features continues with the compact size and thin profile of the charger. You may fold it several times when in need for more space in your backpack. It’s easy and very safe to use the charger and the short circuit and surge protection technology is responsible for keeping safe your charging devices. To all of these features and qualities, we need to add the versatility as you may use the solar charger for smartphones, Apple, tablets and various USB-charged gadgets. Regardless, for the slim profile and reliability, you shouldn’t worry much about not staying connected when having this in your backpack. 8). 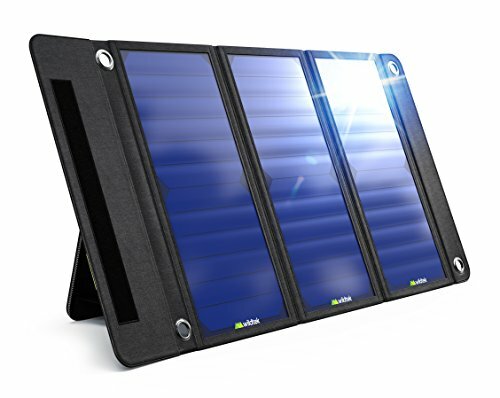 Entirely waterproof and dustproof, the Wildtek SOURCE 21W Waterproof Portable Solar Charger Panel is very reliable, especially for the weather challenges. The solar charger is waterproof and dustproof, even though you may pay attention to the USB ports when charging your devices. The solar charger presents SunPower solar cells which means it charges fats and delivers fast the power. The Wildtek’s SmartCharge Technology helps the charger identify your device for best charge. The charger is compact and very easy to store away when not in use. It also folds very easy for winning some extra space in your backpack. The built-in stand gives the solar charger stability for more efficient charging, whereas the carabiner’s let you strap the panel to your backpack. The versatility of the charger is great and you may charge two gadgets at one due to the dual USB charging ports. We also notice a zippered pouch on the back so you may store some cables. The solar charger presents a good layout and a sturdy build. It’s compact, made with durable materials and seems to be handling the intense use for quite some time. Lightweight, yet strong, the charger doesn’t disappoint. Despite the minor issues, we still like the solar charge for its build, reliability and lightweight. 9). 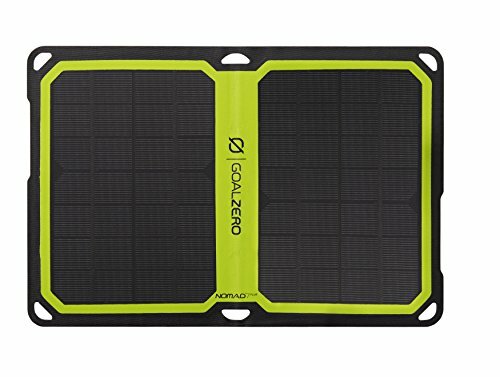 Able to take a good beating, the Goal Zero Nomad 7 Plus (V2) Solar Panel is one solar charger you shouldn’t miss when shopping. The solar charger features a reliable auto-restart and smart electronics so that is optimizes the output that your gadget needs. The list of useful features is long and it continues with user-friendly LED indicators that inform you on the strength of solar conditions. You get fast feedback on panel-to-sun placement for better solar charging. We also notice the kickstand that allows you better angle placement, but also the natural shade for your charging gadgets. A vented pocket keeps temperature under control and the charger includes weatherproof layering. You may safely use it this way on a rain or snow. Let’s not forget the ability to track power flow history, but also the ability to identify the difference between a device that is fully charged and one that disconnected because of weather (shadow, no more sunlight). Portable and well sized, the solar charger comes also with a storage bag on the back. It’s reliable and you may use it for various gadgets and 10-30 watt rechargers. All in all, for all the good things it presents we sure think it’s worth to put your money at stake with this one. 10). Efficient and well made, the SUNKINGDOM™ 60W 2-Port DC USB Solar Charger with High-efficiency Portable Foldable Solar Panel gives you confidence when spending time outdoors, keeping you connected all night long. The Powermax IQ Technology on the charger means it may automatically identify your device, adjusting its charging speed up to 23.5%. The solar charger has dual port for more versatility whenever you’re on the move. You may use it for iPhone, smartphone, GPS, digital cameras and all sorts of 5V USB devices. It also includes a laptop connector and a user-friendly user manual. A voltage regulator ensures steady current for your charging device. The thin profile isn’t fragile and the charger folds very small. Therefore, it’s easy to store it and to display just as well. The polish surface is scratch resistant and the charger comes in a waterproof PVC fabric, for longer lifespan. Let’s not forget the eyeholes that are well placed and easy to use. It’s not difficult at all to attach the charger to your backpack, tent or to a tree. Lightweight, easy to use and so compact, the solar charger is the next best thing that any hiker should have. All things considered, for the thin profile and dependable power, we wouldn’t skip this one when shopping for our next hiking trip. 11). 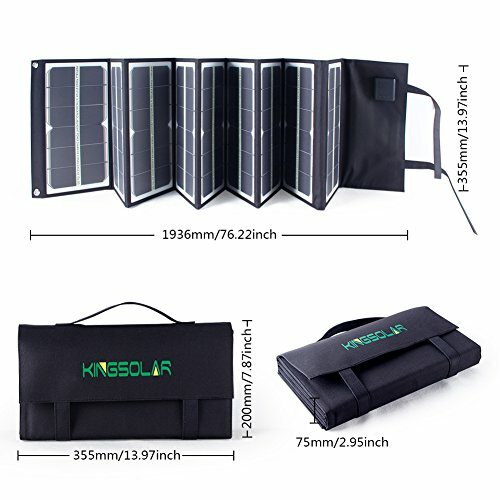 If you’re determined to step up your game, there’s no reason for you not to try the KINGSOLAR Highest Efficient 80W Foldable Solar Panel Portable Solar Charger Dual Output (USB Port + DC Output). The solar charger is built with a camper’s needs in mind, so not only it’s powerful and fast, but it’s also well made, ready to take a drop. It’s the charger to take whenever hiking, camping, boating or spending time outdoors. Furthermore, the charger presents some fluorence strips that make it so easy to spot in the darkness. It comes with DC18V and USB output for so many devices, including fans, for instance. The 80-watt mono solar array provides up to 22% energy. The charger has a solid built and folds nice and easy, for better storage. Its compact shape doesn’t take much space so you can out it away in your backpack when not in use. The build of the charger isn’t just solid though. You get a solar charger that has resistance to scratch, water, rain, shock, and dust as well. A voltage regulator makes sure you can safely use it at all times. The solar charger comes with plenty of useful accessories: laptop connectors, crocodile clips, and conversion cable. The user manual is easy to understand and to follow. Powerful, fast, versatile, and easy to fit, the solar charger is one beast easy to carry around. For those of you who aren’t scared of paying the extra buck for a solar charger though, this one sure stands out as a great choice any given day.